We've given the Total Guitar a fresh new look, plus we've added loads of new regulars throughout the mag including features, lessons, song tab, gear and more! Here are just a few of the brand new things you'll be seeing every month in TG. We know you love learning songs from TG, so we've added an extra tabbed track with audio playalongs on your CD. Our new track is presented in association with Rock School's Acoustic syllabus, and each month we'll be bringing you brilliant acoustic arrangements of well known tunes for you to try. Combined with our existing Classic Track and Open-Mic Songbook tabs, TG once again gives you more tabbed tracks complete with audio than any other guitar mag! 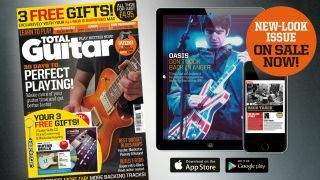 We want to make it easy for you to get better at playing the guitar, so we've brought in some regular tutorials at the front of the magazine aimed at beginners and intermediate players. Our regular 'Getting started with…' and '20 Minutes to better…' lessons will have you nailing the things you've always wanted to learn but didn't, and the things you just need to brush up on in no time! That's not all, though. We've added columns on music theory, a regular Jam Track for you to improvise over, plus 'The Turnaround', where we study the licks and tricks of the blues legends. We're called Total Guitar for a reason - we're not just a metal, blues, indie, punk, acoustic or classic rock guitar mag. We're all of these things! Every issue we aim to bring you the most diverse list of artists possible. This month, we're spanning everything from gypsy jazz (Remi Harris) to in-depth interviews with hard rock heroes Alter Bridge, modern metal virtuoso Tosin Abasi to legends like Billy Gibbons and Sting! Our brand new 6-page TG Unplugged section means that every issue we'll be bringing you up to speed with playing tips, acoustic artist interviews and our TG Unplugged acoustic song arrangement! We know what it's like to search for new gear, first comes the gear lust, next stop: obsession. We've revamped our reviews section - 'The G.A.S Station' - to focus on the best new affordable gear on the market. Our themed pedal round-ups and TG Test will take the pain out of deciding which bit of kit is right for you! TG issue 286 is on sale now. If you'd like to buy a print copy, you can order it online here, or try our digital editions for Android or iOS if you want it right this second! Alternatively, why not check out our latest subscription offer, where you can bag three issues for just £5.00!